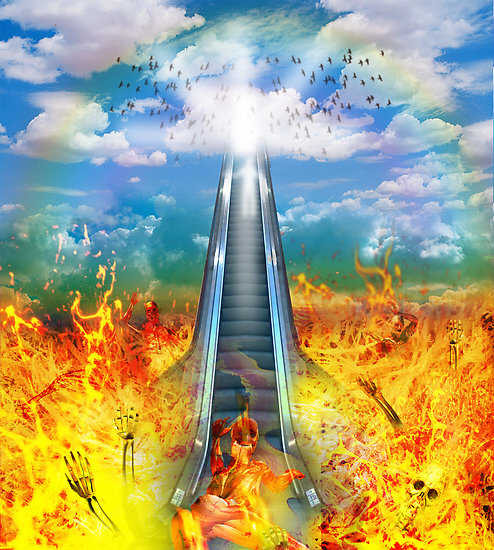 Moving into April is like stepping onto a vibrant, high-powered Cosmic Escalator. This requires the release of hectic mental and physical activity with the willingness to let yourself be carried into an expanded awareness of the new life that is awakening on the Earth. Whether you resist and try to walk back down the stairs or try to move faster by running up, the speed and movement of the escalator will not change, and you will have only created stress in your inner being. Far better to surrender to the flow of this Escalator of New Life, being very clear about what you want to experience when you get off the escalator at the end of the month. Oh, you may not know what it will look like, but you surely know deeply the experience that you want to feel, because your intentions are very clear. That deep power of Well-Being within, the sense of Calm Certainty that you can bring to every moment, that expanded perspective that leaves you Alert and Aware of your opportunities: all the qualities of consciousness that you desire to fill your life with, these are the frequencies that you need to hold as you ride the Cosmic Escalator that April is offering. This is the time you have been waiting for – the ascension of humanity to the Harmony of All That Is. You are experiencing a new world awakening in the 5th Dimension. Bring what you have learned into the present moment and let these tools support you as you are carried on the Cosmic Escalator of your life. It will be as you make it – as you decree, so will it be. I AM that Violet Consuming Flame that is all mastery and All Power to change all things into Divine Perfection right Now. I AM that I AM in action here, Now and Forever. Almighty I AM. Almighty I AM. Almighty I AM. So Be IT. New Life is unfolding during the month of April on this Cosmic Escalator of Life. You can stay the course with your mind and heart in alignment with the great I AM that you are. And So it Is. A new membership program to offer monthly spiritual support for your new life awakening will be available very soon. In this program, Shanta will be offering a recorded teleconference each month near the Full Moon to track the frequencies we are all experiencing. During the experiential meditation, there will be a transmission that brings supportive resources deeply into your being to assist your process of staying in full Balance during your awakening to new life in 5D. An invitation to join will be sent later this month. Shanta’s popular and transformative Timeless Practices for Living in Light Program is now available for download. In this 3-session teleconference, she shares the deeply empowering spiritual practices she learned from her guru nearly 40 years ago, as well as the lessons she has learned from Archangel Gabriel through his teachings that began in 1990. This program is for anyone who desires to bring more of their spirituality into daily life and have less separation. It is for those who are curious about ancient teachings and want to explore what has been proven over thousands of years to bring connection to the Divine. It is for those who are looking for practical ways to be more at home in their bodies and in the world. Drinking in Balance, the spring Equinox teleconference Shanta led that installed your new inner Gyroscope is also available for download. The Gyroscopic Stabilization field that was transmitted during the Equinox teleconference provides amazing balance and support during this active season leading to the June Solstice. Listening to this teleconference can give you a personal experience of the new powerful Gyroscope newly installed through the Grace of Archangel Gabriel within your solar plexus. Learn more here. The Bridging Heaven on Earth Residential Retreat in Mt. Shasta is now scheduled for the Solstice Weekend, June 20-22. More information is coming soon! Shanta Gabriel is the author of The Gabriel Messages and shares her 40 year spiritual practice and experiences gleaned from the her long life path to support others in their spiritual awakening. Copyright © 2014 Shanta Gabriel, All rights reserved. You are receiving this email because you opted in. If you are receiving it in error, feel free to unsubscribe.